Installation view, Art Stage Singapore, 2011. All images: Photo ART iT. On January 12 at the Marina Bay Sands Exhibition and Convention Centre in Singapore, regional collectors and art professionals had their first look at the latest fair to be developed by Lorenzo Rudolf, former director of Art Basel and ShContemporary. Open to the public until Jan 16, the inaugural Art Stage Singapore is the latest in a string of recent attempts to harness the potential of the Asian contemporary art market and produce a viable alternative to fairs in the US and Europe. Nevertheless, the general format is by now familiar to art lovers across the world, with a section for premium exhibitors, Gallery Stage, and a curated platform for emerging artists presented by young galleries, Project Stage, in addition to a line-up of artist talks and panel discussions. Backed by government agencies including Singapore’s National Arts Council and National Heritage Board, Art Stage also integrates an exhibition for local artists, “Remaking Art in the Everyday,” as well as off-site projects like the multi-site showcase “Collectors Stage: Asian Contemporary Art from Private Collections,” co-organized by the Singapore Art Museum, making it one of few fairs capable of going beyond the purely commercial sector in communicating the current state of Asian art. With spacious, high-ceilinged booths – the smallest of which is just under 50sqm – and broad hallways that allow visitors to take their time in viewing works, the fair venue also provides an excellent exhibition environment. 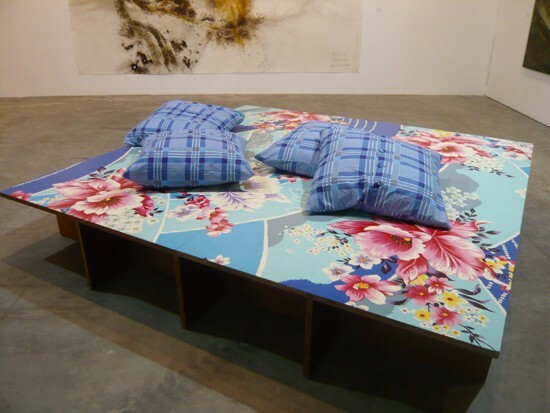 Michael Lin – Lisboa, Cama de dia (2003), Emulsion on wood, pillows, 240 x 240 x 39cm. What remains to be seen is whether the fair will result in returns for its participants. 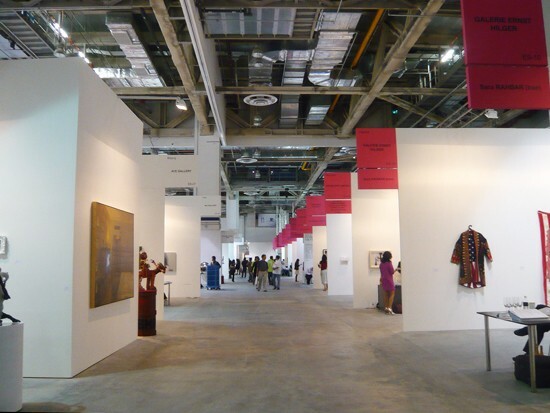 With the success of the third edition of the Art HK art fair in May 2010 and the emergence of strong regional collectors spurring interest in an international Asian market, Art Stage is up against high expectations. Activity during the preview seemed to be conducted at a measured pace, although there were some notable sales. Taipei’s Eslite placed an installation by Michael Lin, Lisboa, Cama de dia (2003), priced at USD 110,000, with a new Malaysian collector, and a painting by the same artist with a collector from the Chinese mainland. Beijing’s Boers-Li found a buyer for Yang Xinguang’s floor-based installation Dead Bird at USD 14,000. From New Delhi, Nature Morte pre-sold Thukral & Tagra’s painting Somnium Genero – Turbo XII to a Taipei collector for EUR 80,000. Left: Thukral & Tagra – Somnium Genero – Turbo XII (2010), oil on canvas, 198 x 360cm. Right: Installation view of Boers-Li booth. Participating dealers who spoke with ART iT cited the purchasing potential of Indonesian collectors – who have noticeably increased in number in recent years – as one of the main attractions of Art Stage. However, it may take some time before Indonesians can become a driving force for a broader market. Rifky Effendy, director of the Bandung gallery Platform3, which features a program of conceptual and installation artists, told ART iT that Indonesian collectors still gravitate toward paintings that are easy to understand. Nature Morte’s Peter Nagy seemed to embrace the long-term perspective, telling ART iT that following the financial crisis of 2008 galleries can no longer attend fairs expecting to profit, and must now think of such events as a necessary means for simply meeting new collectors. Galleries attending from Japan include Tomio Koyama, Nanzuka Underground and Wada Fine Arts.